The tax returns filing for income earned during the financial year 2016-17 will be on in full swing soon. The company would have handed over the Form 16 of their employees. Companies and self-employed too will be filing their tax returns as per their deadlines. As you prepare to file your income tax, one of the basic things you should know is which tax form should you use to file your returns. 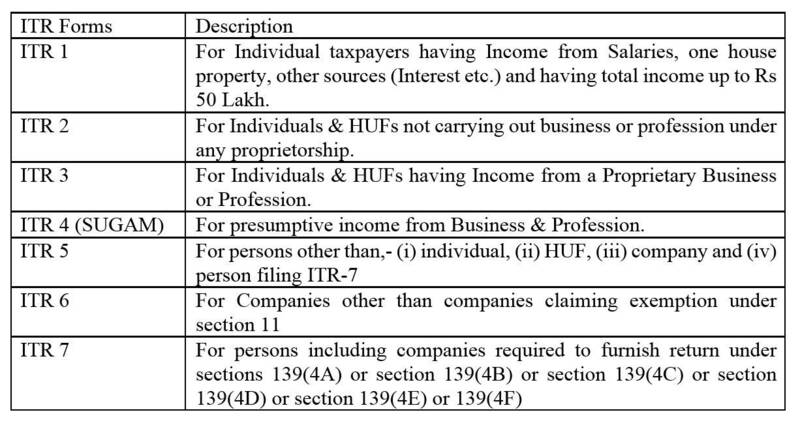 The Income Tax Department has specified different tax returns form for a different class of taxpayers. Sudhir Kaushik, co-founder and CFO, Taxspanner.com, advises being extra-careful while filing tax returns and wrong entries could be taken as concealment of income by the tax department. â€œThe income tax return form is a legal declaration and a binding document in which ignorance or casual mistakes are equivalent to â€œincome concealmentâ€. Hence, the minimum return clearance criteria for seamless processing of ITR would be matching data,â€ Kaushik said. He also pointed out that tax return filed by the assessee has to have minimum prescribed income/loss details. It must reconcile with the information already available with the department.